What’s your Focus? That is the question the Ford Motor Company is asking fans in the What’s Your Focus Sweepstakes 2017 running online at WhatsYourFocusSweeps.com. 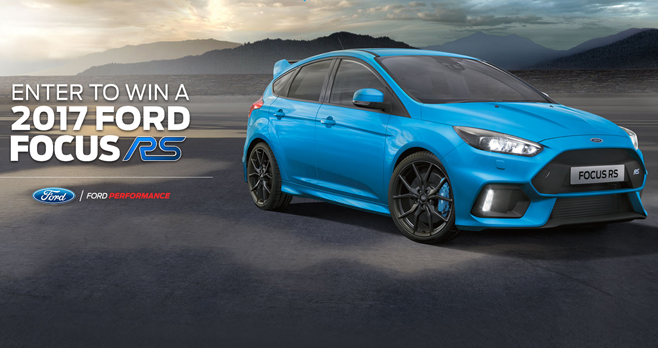 Now through October 14th, Ford Performance lovers are invited to enter this Ford Sweepstakes for a chance to win a car. One lucky grand prize winner will drive home a brand new 2017 Ford Focus RS valued at $48,000. Enter Online: Participants can enter online by visiting the Sweepstakes website available at www.whatsyourfocussweeps.com. Once on the webpage, participants must complete the online entry form in its entirety by providing all requested contact information and submit the entry form as directed to be entered into the Sweepstakes. Enter By Mail: Entrants can also participate by mail by sending a piece of paper containing their full name, date of birth, phone number and mailing address in a self-addressed envelope to: What’s Your Focus? ?Sweepstakes c/o Campbell Marketing and Communications, 3200 Greenfield Road, Ste. 280, Dearborn, MI 48120. All entries must be received by October 14, 2017 to be eligible for the Grand Prize Drawing. The Ford What’s Your Focus Sweepstakes 2017 is open only to legal residents of the 48 contiguous United States and District of Columbia who are at least 18 years of age or older as of date of entry with a valid driver’s license. Begins at 12:01 PM Eastern Time on March 31, 2017 and ends on October 14, 2017 at 11:59 AM ET. One Sweepstakes Registration per person during the Promotion Period. Sponsored by Ford Motor Company, 16800 Executive Plaza Drive, Dearborn, MI 48126. Administrated by CCO Communication, Inc., d.b.a. Campbell Marketing and Communications, 3200 Greenfield Road, Suite 280, Dearborn, MI, 48120. For Sweepstakes results, please visit www.whatsyourfocussweeps.com. For complete details, see the Official Rules. So excited you have offered a chance to win a 2017 Focus RS. My family needs a new car so badly. Hope I am lucky enough to win. TY again. I would like to win a new Ford Focus. Ford is a good vehicle,it would be a very good one to win.